Life – Curveballs, Confusion and Chaos? Morning. Ten thousands of tiny droplets gush forth from the belly of the sky and splash a thousand upturned leaves and grasses and budding things. The sun breaks through the clouds and the shadows of birds flit across the page of my journal laid open on my lap. The shadows of my own hand and pen dancing with the songbirds of the morning light. Sitting still here on the porch, I listen, and the birds' songs invade my thoughts and penetrate my heart. Such familiar sounds, yet the newness and enchantment of their call never fades. A brazen Blue Jay lands nearby. His eye on me and mine on him. He speaks tersely to me in some dialect of the Blue Jay Tribe. Enough said and off he goes to assault other ears perhaps more keen than mine. The thrill of the close encounter induces a child-like smile across my face. Ah! suddenly, piercing the cacophony of Aves' notes there rises in clear tones above the others the beloved song of the Wood Thrush. A flute-like trill characterizes a portion of his blessed song. I close my eyes and praise the God of the song. I move to the other end of the porch as his song draws me closer, but, alas, like a phantom he moves on and I am left alone, yearning, gazing into the woods. Oh, how I long to see this elusive creature of the deeper wood. "Lord, you know how I love the sound of the Wood Thrush and how I long to catch just a glimpse of him. I am content to hear him, yea, overjoyed to hear him, but, oh, how nice it would be to see him as well!" Indeed, I think that perhaps the unfulfilled longing is meant to teach me that my deepest longings can never be fulfilled here on earth. Next day. Same porch. With Bible open I am distracted by the scene of a Black-Capped Chickadee chasing and deftly catching a moth in mid-air. I regain control of my attention and return to the pages before me. It feels like rain. It smells like rain. The scent of the Lilacs is heavy and hanging in the dewy air. The pages of my journal have a damp weight to them this morning; even the ink of the pen feels heavier. I thank God for the impending shower and for the little bright green leaves that seem to have popped out overnight. Again, my eyes return to the open Book. Without warning, a loud thud to my direct left startles me. I know the sound immediately. I have heard it before but from the inside of our house, never from the outside, and certainly not 3 feet from where I sit. It is the sound of a bird flying into the clear glass of a window. I turn quickly enough to see its limp body fall to the porch floor with a stunned chirp. Amazed, I leap up from my seat and realize immediately that before me lays none other than a Wood Thrush. My hands rush to my face as I gasp and then to my heart. 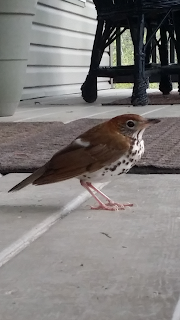 In that moment I felt as if the Lord had said, "You want to see a Wood Thrush? Here you go!" and with divine precision that poor Wood Thrush was hurled into our living room window. Dazed and confused the bird lay on its side, beak open, eyes closed. I was completely in awe. Didn't I ask for this? But, oh, to see it like this? I immediately got down close to him and began to pray. "Oh, thank you, thank you God, for this rare opportunity but please, oh, please don't let him die! I wanted to see him and I thank you but, please let him live!" The bird righted itself on its unbelievably skinny little legs. His beak remained open and his head was tipped all the way back and his eyes remained closed. For the next 15 minutes I stayed near him. I lay flat on my stomach on that porch floor looking at this wonder of song. Such a small creature yet out from it flows such a large song full of depth and beauty. Its cloak of brown feathers with its underbelly of speckled white is quite unremarkable. It belies the depth of beauty found within its breast. Eventually, his eyes opened and there we sat staring at one another. Me and a Wood Thrush, face to face, not 2 feet between us. I've enjoyed his song for years on this property but have never seen him. What a wonder, I mentioned it to my God yesterday and He arranged for a meeting today. My heart was filled, simply filled with the beauty and nearness of this creature and with the God who threw him into my window that morning. All at once my winged visitor shook its head, gave one last look, and off he flew. My mouth closed with a sacred sense of awareness and my heart burst wide with gratitude. "...For your heavenly Father knoweth that ye have need of all these things." Some people think God’s voice booms like the roar of the ocean waves. I think it sounds like a Wood Thrush in the early, dewy morning just out of sight in a wooded glen. Love your story of how God answers even in the little things!